There’s so many cool things to see out in space — from gorgeous views of Jupiter to stunning glimpses of Saturn, and a star that might have aliens hanging out nearby — that it’s easy to forget that it’s actually a pretty hostile place. We’re reminded of that whenever NASA alerts the world that an asteroid is making a close appearance, and a scientists with the Jet Propulsion Laboratory just took some time to break down the next five asteroid flybys that we should all keep our eyes on, including one that might be too close for comfort. 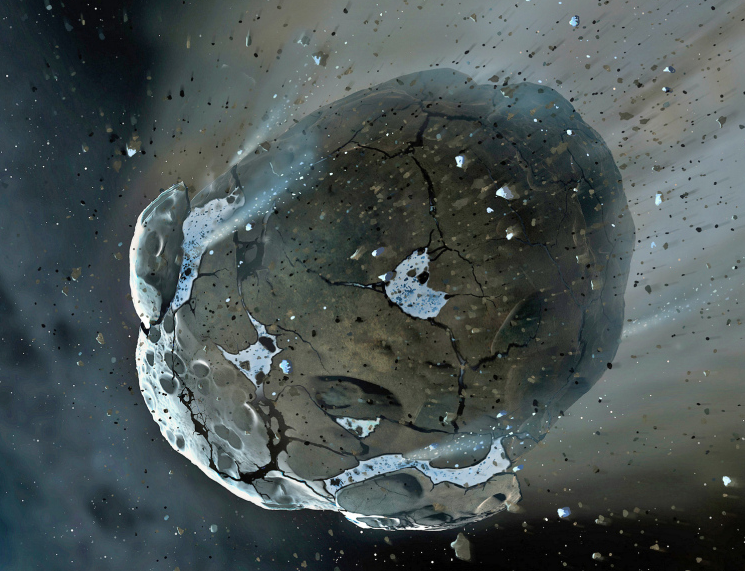 The handful of asteroids, which are thought to be as small as 8 meters in diameter to as large as 90 meters, will all pass within five lunar distances. One lunar distance is the space between the Earth and our moon, or about 238,900 miles. That might seem like a pretty comfortable gap, but in terms of the vastness of space, a rock jetting past our planet at such a distance is a pretty close shave. The largest of the rocks, called “2017 BS5” is also the first to make its trip past our planet. It is expected to fly by at a distance of 3.15 lunar distances on July 23rd, 2017. The next asteroid encounter will be the closest pass of them all, with asteroid “2012 TC4” coming within 0.15 lunar distances of Earth on October 12th, 2017. 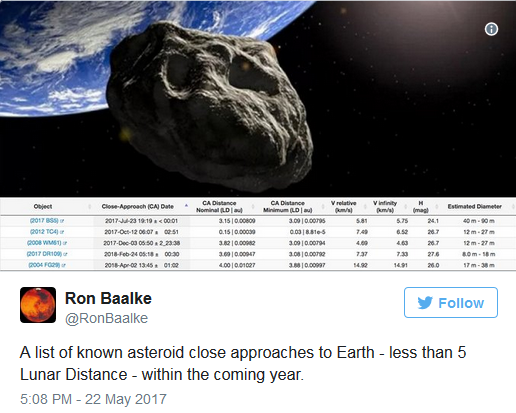 That’s a distance of just over 35,000 miles, which is an extremely close pass, but the asteroid is only thought to be 12 to 27 meters in diameter, making the event slightly less worrisome. The last three flybys will take place starting on December 3rd of this year, then again on February 24th and April 2nd of 2018. All three of those rocks are expected to pass at a more comfortable distance of between 3.69 and 4 lunar distances.